Brake Rotors-BrakePads - Brake Pads By Wagner - Page 1 - Auto Parts Canada Online Experts in the Auto Parts Industry. Brake Pads By Wagner ThermoQuiet. Ready to do a brake replacement? Get the best brake pads, Brake Shoes and Brake Parts at Auto Parts Canada Online. Get brands you know and trust at great prices. Wagner® Brake Products — #1 in Global Friction OE & Aftermarket — provides the latest innovations in braking technologies and complete coverage for passenger vehicles and medium-duty commercial applications. Wagner Brake Products continue to set industry standards with engineering expertise and a commitment to ensuring that our parts deliver original equipment fit, form and function to deliver superior braking performance. With comprehensive coverage, Wagner Brake offers all the components necessary for a complete brake repair. The Wangner ThermoQuiet is a premium product and offers exceptional quality for all the latest applications. Wagner ThermoQuiet® is the “One Piece Brake Pad” that provides quieter braking and superior stopping performance in any driving condition. 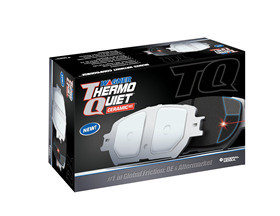 Exclusive Integrally Molded Sound Insulator (IMI) dissipates heat and vibration for quieter braking. Proprietary friction formulations provide superior stopping performance and less dust. Comprehensive coverage for foreign and domestic vehicle applications. Can't find the Brake Pads for your vehicle ?